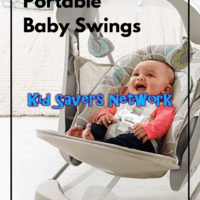 A portable baby swing is ideal if you’re looking for a baby swing that saves space and can be moved easily. They’re also great to travel with you on visits to friends and relatives, too. You need to be careful when choosing a portable swing for your baby. Parents have reported quite a few issues with their motor. Products from even the leading baby brands can stop working after just a few months. Or they don’t have enough power to really swing a baby and burn through batteries. 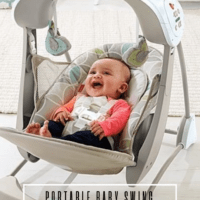 To help you choose the best portable baby swing, we can recommend the following 7 designs in 2019. This model features 5 different speed options with an automatic timer and soothing vibration. The action is also nice and gentle which is a big plus. Many swings seem to want to launch their precious cargo into space! So with this ingenuity baby swing you can both rest a bit easier. Having a timer in my eyes is essential as it really does save on the batteries. There is also a toy bar to keep your little one entertained when they are awake. The seat pad and cushions are completely removable and washable making it pretty easy to clean. It also has a great slim-fold design that makes it easy to store or travel with. One drawback for this particular model is that there is you can’t use mains power. It only takes batteries and does claim its patented “Hybridrive technology” makes batteries last 3 times longer than it’s competitors. Still, I imagine over its lifetime it will use a lot of batteries, especially if this happens to be your baby’s favorite toy. Another point to consider (especially if you’re after a travel baby swing) is the weight. At 13.8 pounds it’s almost 50% heavier than the Bright Starts model below. Overall, this is a great swing that many parents love. You can find the latest price here. Graco has a reputation for making great baby products and their Simple Swing is no exception. You’ll find the Simple Swing easy to assemble and when swinging no louder than a ticking clock. It has six speeds and ten classical melodies and 5 nature sounds to help soothe your baby. What sets this swing apart is that it has a 5-point harness. This is the kind of safety harness you’ll find in high-end strollers. It helps stop your little one from flipping themselves out when swinging. There’s also a comfortable head rest which is needed as infants neck and back muscles are still developing. Another great feature is the Graco Simple Swing can use both batteries and mains power. This will help save on the batteries and home and still make it convenient to travel with. There is also a timer so you can estimate how long it’ll take your little one to drift off and the swing will stop. Again, this is a feature some comparable swings don’t have and it can help save batteries and power. There are a few things I don’t like about this model. Although it says “Portable” on the box – it doesn’t fold! This makes it hard to travel with. The Fisher-Price Snugapuppy is a great travel swing. One happy father reported that he was able to fit the unassembled swing into a standard-sized suitcase along with some other baby gear. This is definitely a big plus in our eyes! Not only does this model swing, it also has calming vibrations, sounds, and music. The vibration setting has proven a big hit with parents as it helps getting baby to sleep. It’s also great to have more options for when your little one is a bit finicky! There are two birds attached for your little one. This allows your child to bat at them and helps promote gross motor skills development. The birds also chirp which is a really cute touch! Another great feature is that it senses your baby’s weight and will automatically adjust the speed. It also comes with a lovely plush newborn insert as well. This means you can use the Take Along Swing from birth. Some parents have complained that this product can be difficult to assemble. The pieces are not properly labeled and the directions aren’t very helpful. Parents who have assembled it in pairs have done a lot better, though! Overall, this is a great portable baby swing. It folds flat and makes travel and storage easy. When you consider the price, it could be one of the best baby swings of 2019. 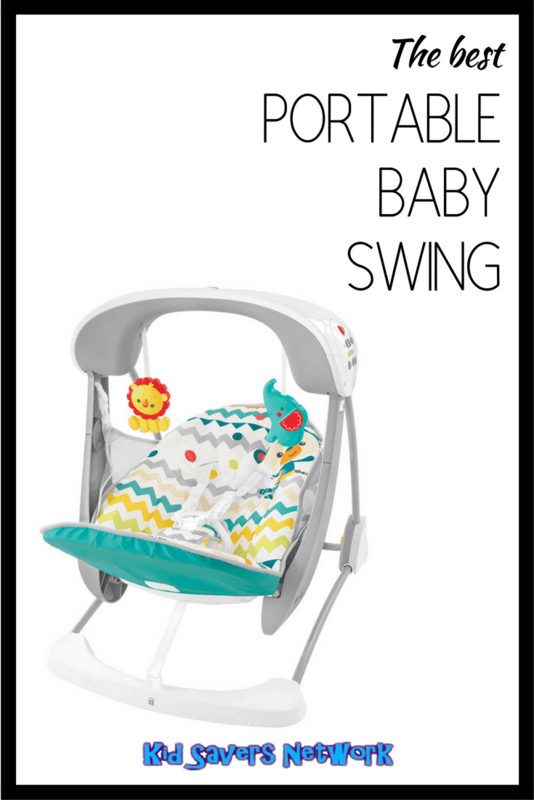 If you’re looking for a quiet, baby swing that folds compact and flat – this is the one for you! Parents love the Comfort & harmony Cozy Kingdom because it’s whisper quiet and it’s super easy to clean. The pad and headrest are removable and machine washable so it can be as-good-as-new as no time. This is a big plus because this is a “Short-life Product” (until around 6 months / 20lbs). Being machine washable makes passing it on or selling it a lot easier! It’s easy to assemble and the fact that it folds flat makes taking it to the grandparents and on trips really easy. It also helps with storage. If your house is like mine baby things are everywhere so it’s good this can easily go in a closet or flat against a wall. There are a couple of things you need to know. The first is there is no mains power adapter. So it runs on batteries only, but the Cozy Kingdom doesn’t seem to burn through them. Secondly, the swing doesn’t stop immediately after you turn it off. I think this is to prevent jolting a sleeping baby, but you need to get used to this! Overall, at this price, the Cozy Kingdom is better value for money than baby swings costing two to three times as much! The next two baby swings we reviewed are slightly different to the others on the list. They are different from usual design and don’t rely on batteries. You can also use them with newborns and they are portable! Take a look at the Ghodiyu Swing and the Swaddle Swing. The word ‘Ghodiyu’ is a word that originated in India and means helping baby sleep. It looks a bit strange, but Indian mothers have been using these for centuries. It’s believed to help infants fall asleep quickly whilst also developing proper sleeping habits. The Ghodiyu is sometimes referred to as the “Miracle Hammock“. This is because it works miracles helping babies fall asleep faster and can also help relieve a baby’s upset stomach or any other colic issue. The hammock is designed to hang low at its center point. This gives the Ghodiyu a smooth and easy swinging motion. It is easy to set up and many parents love just how portable it is. It only takes 2 minutes to assemble without any tools! You can take it to visit the grandparents or other family and friends. It is even lightweight enough to travel with during flights. A 4-foot carry bag is included, and it weighs 7kg. This makes it relatively easy to put in your trunk when going out with your baby. The frame is made out of stainless steel pipes. Unlike other swings which eventually have problems with their motors, you can use this one with all your children. It’s also greener as it doesn’t need batteries. A drawback to this design is it doesn’t have different reclining positions. Your baby can only swing fully on their back. Compared to the others on our list, the Ghodiyu is pretty pricey. But you need to factor in its longevity and that it can be used from newborn. Minimum assemble required. All the steps are well descirbed. Hammock for Baby is also included along the cradle. The Kidco Swingpod is a truly unique design. It combines all the benefits of a baby swaddle and a baby swing together! The great thing about this design is its sole purpose of calming your little one. With the swaddle swing you can do that almost anywhere: a restaurant, airport, friend’s house, etc, etc. The list is endless. It is very portable, lightweight and easy to pack. You can even fit it in your diaper bag! To use this, simply place your baby into the swaddle and swing them. The manufacturers claim that it can calm even the most colicky baby. There is no weight limit as it has been tested to support up to 1600 pounds. I’m not sure if it’s suitable for baby elephants, though! You do need to be aware that the Swaddle Swing is “parent-powered”. This is great as it saves on batteries (and gives you a bit of a workout!). It’s probably not for you if you want something automatic so you can also do other things. As it’s so easy to carry and pack, you are able to take it anywhere and everywhere with you. You can check out the latest price here. 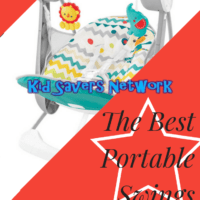 The KidCo Swingpod portable Baby Swing is the only baby swing and baby swaddle that is portable and packable. It is a great travel baby swing and also functions as a portable baby changing pad. The best baby swing for infants. The Swingpod can take the place of many baby swings and bouncers. It is a baby swaddle and baby swing portable. Proven to be the best colic cure for baby colic. Thousands of new parents swear by it. A great swaddle blanket and swaddle sack combined with the functionality of a baby swing will make your baby the happiest baby on the block. The strong swaddle strap really works like swaddleme. Swaddle Up your baby in the Swingpod. The Swingpod swaddle pod is the new and improved Swaddle Swing. Traveling with a baby. The Swingpod is the most portable baby swing on the market. It can also be used as a portable baby bed and a portable baby changing pad. Do not go on a trip without your travel baby swing. Travel baby swings for infants will get you a happy baby. Instant colic relief. The Swingpod is the best baby swing and baby swaddle for colic ease. The combination of a baby swing for infants and a secure swaddleme like swaddle blanket works better than any colic drops. If your baby has baby colic, colic calm the Swingpod will work. 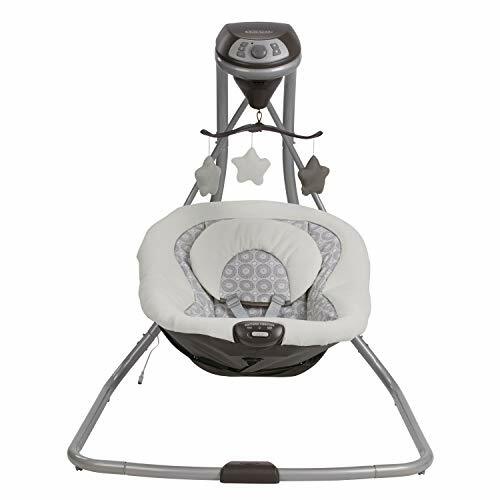 Be the star of the baby shower with the infant swing Swingpod. It is an infant swing outdoor baby swing outdoor. 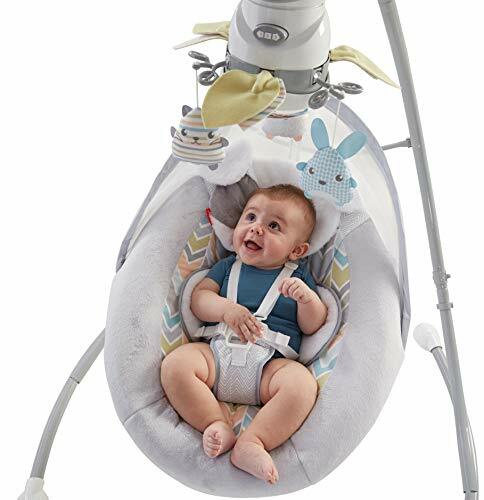 Your search for baby shower presents is over when you buy the Swingpod baby swing and baby swaddle. Gender neutral color, great baby swing girl, travel baby swing girl or boy. The Swingpod baby swing, baby swaddle, swaddle blanket provides unmatched colic relief making your baby the happiest baby on the block.